Cinder Linh is an orphan. She is looked after by her adoptive father's wife after he died. She has two of her own girls though, human girls. Cinder is a cyborg, which means that she is worthless in most people's eyes. The only thing she's good for is earning money as a mechanic. Though her life is not enviable, it's good enough for now. Then Prince Kai comes to her to ask Cinder to fix one of his androids. Soon after, her favorite sister gets the plague and everyone blames Cinder, even though Cinder is fine. The Prince has many struggles and heaped onto that is a forbidden attraction. 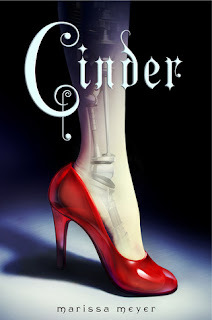 Cinder is just trying to help her sister and find an escape to a better life. With all the chaos stirred up, they might have to look to each other for some help. YAY, a re-telling of Cinderella. This was a fun story and a great take on the classic. One thing that really disappointed me, is that the big secret was obvious within the first 50 pages. That takes a lot away from the reading experience, when you know exactly what's going to happen. The journey to the reveal was good though, so it was not a wasted reading adventure. I really enjoyed Cinder and Iko's characters. The banter between the two of them was fun and light. Prince Kai was charming and funny too. He was a very like-able guy, which is a curious but welcomed trait in royalty. I really enjoyed the cyber take on Cinderella, it made the story quite fresh especially with the added Lunar people aspect. The whole setting was really interesting, but sort of downplayed. The environment was nor payed too much attention to, which I guess the characters wouldn't, but I just felt like NEW BEIJING! could have been amazing, but just felt like any other place on Earth. Cinder's cyborg struggle with her identity was also a bit lackluster. She seemed to just start to delve into a deep thought about her machine versus human parts, but then something always seems to distract her. Each part of the story started with a snippet of the original which was fun. This was a good read and I look forward to the next one. I was very disappointed with how this one ended though. It ended right in the beginning of a big action-y scene. It's a clever but painful ploy making the reader have to read the next book for resolution. Nevertheless, I will keep my eye out for this next installment. "The screw through Cinder's ankle had rusted, the engraved cross marks worn to a mangled circle." "Cinder pried herself away, limbs still shaking from the raw energy inside her." Audio book sample: Check it out here! It's a real pet peeve of mine when books end in mid flow - it's not an ending!! Great review, I still really want to read this but I might wait now until nearer the time when the next book will be released.